Teach on the Edge: BLinAction.com Live! 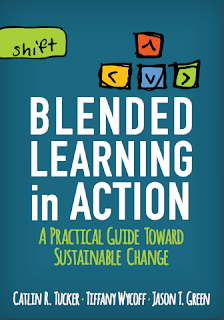 Over the past few months, my coauthors, Catlin Tucker and Jason Green, and I have worked on a companion site for our book Blended Learning in Action. We have created a space where our readers and anyone hoping to incorporate blended learning strategies into their classes can gain insight, follow our #blinaction book chat, and gain access to curated resources. We plan to add more and more resources to correlate to the book's chapters and to spotlight many voices from teachers and leaders implementing blended learning. Please check out the site blinaction.com and we would love to hear from you via the "Contact Us" page or Twitter @teachontheedge, @catlin_tucker @jasontoddgreen!